When Josh Kerr says he’s “getting comfortable”, that doesn’t mean he’s allowing any form of complacency to creep into his athletics. Far from it. Instead, it signifies that, when it comes to finding himself in esteemed company on the track, the 20-year-old increasingly feels like he belongs. There was more evidence of that on display as he embraced the experience of his first NYRR Wanamaker Mile last month. Clocking 3:54.72, the Scot shaved more than five seconds from his previous best to finish runner-up in the prestigious indoor race, ahead of athletes including USA’s Olympic finalist Ben Blankenship and New Zealand’s two-time Olympic medallist Nick Willis. For the University of New Mexico student-athlete, enjoyment is key. His hard work under coach Joe Franklin and his team continues to pay off and now, having well and truly made his mark at collegiate level, the double NCAA champion is fast gaining recognition on the international circuit, too. 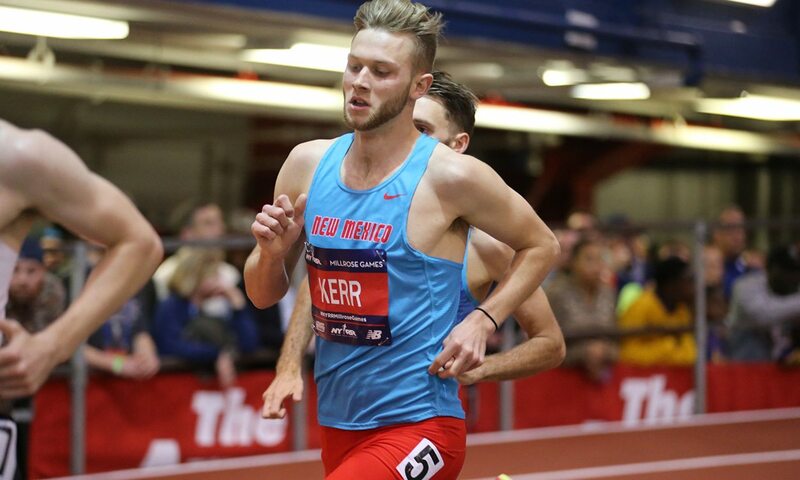 Determined to make the most of his Wanamaker Mile invite, Kerr – who clocked his previous PB of 3:59.90 in his heat en route to his first NCAA win last year – ran a time which moved him from 53rd to fifth on the UK indoor all-time list and saw him become the fifth-fastest miler in NCAA history. His New Mexico record improved a mark which had been set by his fellow Franklin-coached Briton Lee Emanuel – himself a two-time NCAA champion – in 2010. “It was a great run for Josh,” New Mexico head coach Franklin told golobos.com. “For being as young as he is at 20 years old, for him to go against a field that included six Olympians and beat all but one, it’s an outstanding accomplishment. The only athlete ahead of Kerr in New York on Saturday evening was another Scot – Chris O’Hare – and Kerr has been following his countryman’s career with interest. Like O’Hare, Kerr decided that a move out to the States would be the best way to further his athletics and in 2015, aged just 17, he swapped Edinburgh for New Mexico. “Chris has always interested me as an athlete and he is obviously a very, very talented athlete, so I’ve always looked up to him,” Kerr says. “I think a lot of what Chris has done is what I’m doing at the moment. His move out to America was pretty similar to mine. On his move to America, Kerr adds: “The first year and a half or so was a bit rocky, because I was trying to get used to living by myself and just the normal stuff of moving to university. As soon as I figured that out it kind of started going extremely well. The Scottish success of recent years is also a source of inspiration. While Kerr won’t be racing for Scotland at April’s Commonwealth Games, he does have a major target in the NCAA Indoor Championships. After his mile win last winter the 2015 European under-20 champion went on to win the outdoor NCAA 1500m to become the first man since 2008 to achieve the indoor and outdoor title sweep. He then finished as runner-up to O’Hare at the UK trials to secure his spot on the GB team for the IAAF World Championships in London. “It was a great year for me,” reflects the 3:35.99 1500m man. “Whenever I went out and ran a quick race I was thinking ‘I can run quicker’. I was in an awesome position and I was able to stay healthy. “I was in really, really good shape going into the world championships heats and sadly I just didn’t have that kick of speed and probably didn’t race my best race (Kerr was 11th in his heat). Beating the Olympic champion wasn’t good enough that day! “I reflected a lot on that and if anything, it’s just made me even more hungry this year to make no mistakes, be a bit quicker and make sure that, when it comes down to these kind of situations, I’m not being left in the dust, I’m the one pushing that on and making sure that there won’t be big losses like that this year. Another goal this year is the outdoor 1500m NCAA record and while he doesn’t want to get too ahead of himself, the European Championships is also a target.